I love casseroles, total comfort food. I also love potatoes, you could probably do anything to a potato and would still eat it! Ha, ha! 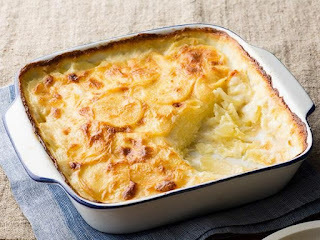 French fry, bake, mash, so versatile, so yummy...creamy, dreamy potato. After eating the scalloped potatoes at the LaJolla Marriott, quite a few times now, I decided it was time to attempt them at home. As usual, I scoured the Internet, Pinterest, YouTube. I came across the best scallop potato recipe. Very rich and creamy with a golden topping. Heaven on a plate I tell ya! But, first things first, I had to buy the handy dandy, slicer, dicer, shredder, for my Kitchen Aid mixer, because I don't know how much time you have but I don't have the kinda a time it would take to slice potatoes for this dish! The slicer shredder attachment sliced me up a whole casserole dish of perfect potato slices in 2 minutes!! Someone at Kitchen Aid is a genius. Thank you. I know I had a picture of mine but cannot find it! 2 cups medium cheddar cheese. Slice the potatoes 1/8 inch thick, use the large slicer attachment on the KA mixer. Shred the cheese using the small shredder attachment, finer shred makes the cheese melt easier. Melt the butter in a pan, saute onions in butter until translucent, maybe 4 minutes, add flour and mix until flour is incorporated into butter/onion mix, slowly add in milk, so your mix stays at a slow boil, turn heat down and add cheese and salt and pepper, once melted, remove from stove. Grease the bottom of a 9x9 baking dish, add one layer of potatoes, pour on some of the sauce to cover, layer more potatoes and top with sauce, add a little more grated cheese on top. Bake for 1 hour. Remove from oven and let sit up about 15 minutes. Dig in to that creamy, dreamy dish. With the help of the Kitchen Aid mixer this dish is just as easy as the scallop potatoes I have been making for years from a box. Well, those box days are over and it is just real potatoes from here on! ANOTHER fabulous recipe - you ROCK!!!! I LOVE scalloped potatoes, but tend to wait til I go home, for my Moms'. Now I can make my own. Thank you! I have never used the box mix but have made so many homemade versions of Scalloped Potatoes and have loved every one of them-potatoes are my favorite food!